Life In A House of Blue ! : Wordless Wednesday - Odd Creature ! Home > Wordless Wednesday > Wordless Wednesday - Odd Creature ! Wordless Wednesday - Odd Creature ! 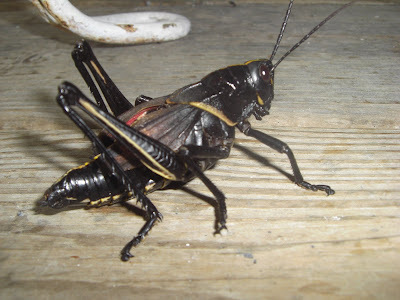 Not sure if you have these where you live, in South Louisiana this time of year they are everywhere.s Here we call them "Devil Horses" (not sure why) but they are Black Grasshoppers ( real name: Romalea microptera) and they are HUGE ! I find it odd that they are a type of grasshopper and I have never seen one "HOP". Ewwww!! We seem to have a lot of grasshoppers this year too, but they are bright green. Either way, yuck! They are huge! The ones we have up north wouldn't even compare! and I would just call him Eeeky nasty bug! Yuck!!!! How big is that thing??? I have NEVER seen a black grasshopper before but we have black dragon flies with white stripes on their wings that are equally as creepy! Ewwww so gross, I can't stand bugs! I love the nickname "devil horses" for them, they kind of do look like creepy little goblins on horses LOL. We have a ton in the field next to our house and it's nice during the warmer months to keep the windows open at night and hear them chirping. I've seen them in all different colors from black, green, clear, yellow, red, white, and a few funky looking purple ones. That is one crazy bug! I'd much rather view this HUGE guy in picture form! I'm not grossed out by it, but I certainly wouldn't want it crawling on me.